O seu amigo/a enviou um convite para que se junte ao nosso Clube. Mudámos e inovámos. Tudo porque para si, só o melhor do melhor! Foi convidado a ter acesso a grandes marcas, com os melhores descontos, que chegam até -90%. "Faz como eu e inscreve-te já em www.bysquare.pt. Grandes marcas, com os melhores descontos." A Bysquare garante um desconto de 10% imediato com a sua primeira compra. Esta mensagem foi enviada porque um amigo seu registado em www.bysquare.pt, lhe enviou um convite. Este convite foi enviado para blogworldreligion@gmail.com por BYsquare. 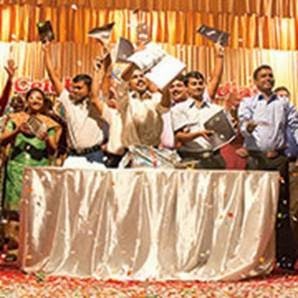 Deaf in India community "hears" the scriptures for the first time! India’s Deaf community is nine million strong. These people exist in virtual isolation and many struggle to learn how to read because written language is based on sound. A DVD Bible has now been released in Kerala Sign Language. And four more Indian sign language Bible translations are currently underway. “My husband has become part of this group of Christian Deaf,” the woman said, standing side by side with her Deaf husband. She was speaking to Bible translators who were working to translate the Scriptures into Kerala Sign Language (one of 28 sign languages) for India’s Deaf communities. “His transformation interested me to come here,” she continued. “He was an alcoholic. He beat me often. My two sons were also abused. I found his activities extremely embarrassing. My sons had become adolescent boys. I was still being badly abused in front of them. One of my sons went to the extent of trying to kill himself. “I had prayed to my gods and goddesses. Many loved ones advised my husband. He would make many promises, but that was just momentary. There was no change. Em anexo uma pequena apresentaço da nossa empresa. Gostariamos de salientar que seriamos um excelente parceiro para gestao dos vossos recursos humanos.